On nice summer evenings when temperatures drop down with the sun, and the mountain breeze picks up, there is no better place to dine in Jackson County than in a beautiful outdoor setting. 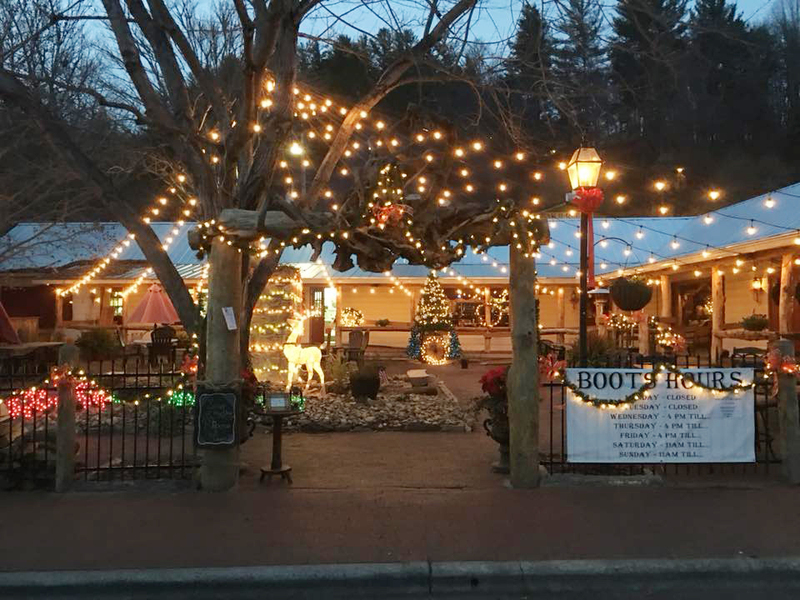 Whether you’re looking for a table for the whole family to try some delicious local fare, a romantic date night under the stars or a cool place to enjoy a flight of craft beer, there are plenty of dining options to set the perfect scene in the mountain towns of Cashiers, Cherokee, Dillsboro and Sylva. Enjoy the fresh seasonal flavors that our restaurants are known to incorporate in their dishes, while taking in the refreshing mountain air and beautiful scenery that surrounds you. 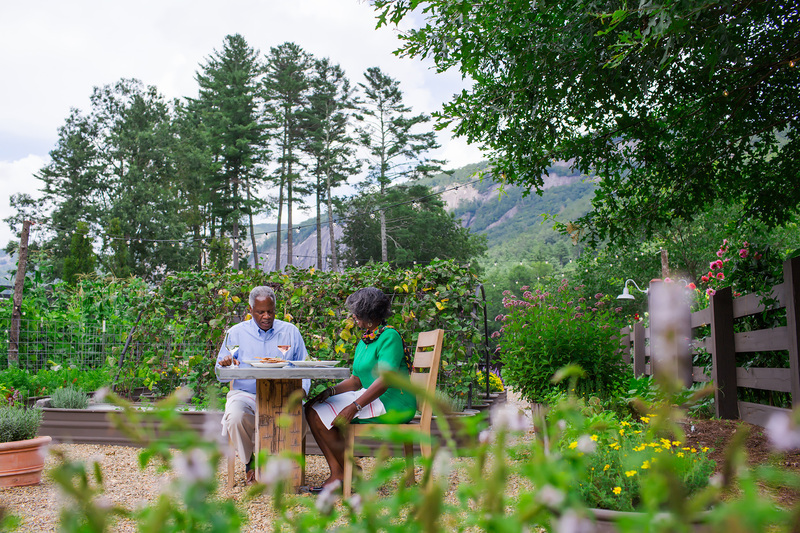 From riverside to mountainside, not just your taste buds, but all your senses will be elevated while dining al fresco in the mountain towns of Jackson County, NC. Known as the finest dining in Jackson County with a fantastic patio and even better views, this farm-to-table restaurant is situated perfectly in Lonesome Valley where visitors will enjoy the incredible landscapes of Cow Rock and Laurel Knob, creating what is known as the largest box canyon east of the Rockies. True to its history and agrarian roots, Lonesome Valley’s Canyon Kitchen offers a humble yet extraordinary connection to food, where ingredients are sourced from local and regional farms. Massive oak beams define the structure of Jennings Barn and its open-air dining. The diverse prix fixe menu at Canyon Kitchen changes weekly based on seasonal ingredients and what is growing in their on-site garden, but you can expect a rich combination of garden goodness and innovative nouveau-southern dishes. Roam the garden out back or enjoy a cocktail while watching the fireflies surround you at this unforgettable dining destination. 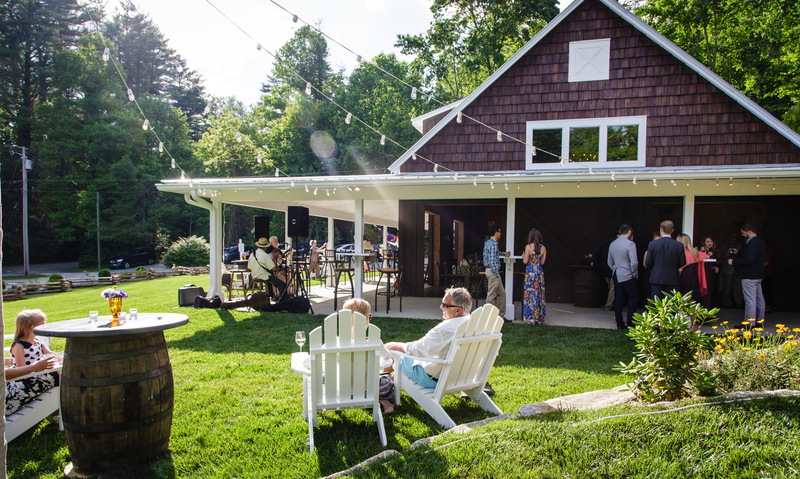 Set in a 100-year-old refurbished farmhouse that overlooks apple orchards and gardens, the restaurant’s elegantly rustic setting is paired with a Southern-inspired menu that offers a variety of delectable dishes and nightly specials. The Orchard Restaurant offers visitors a chance to escape from the hustle and bustle of their every day and relax outdoors while enjoying exceptional dishes prepared with fresh, locally-sourced mountain ingredients. In warmer seasons, guests are invited to enjoy The Orchard’s famous Venison Carpaccio, Appalachian Trout Almondine or the 107 South Bacon-Wrapped Filet outdoors. The covered patio offers serene views of the apple orchard, weeping cherry trees, flower and vegetable gardens below. Any menu item can be paired with a bottle of wine from the cellar, which features over 60 choices of fine wines with a focus on the New World and California wine regions. Consistently named as one of the best porches in Cashiers, Cornucopia offers guests a covered dining area that is comfortable no matter the weather, but especially in the summer. The property has been integral in the Cashiers community since the late 1800s, when it was a general store, school, and post office. 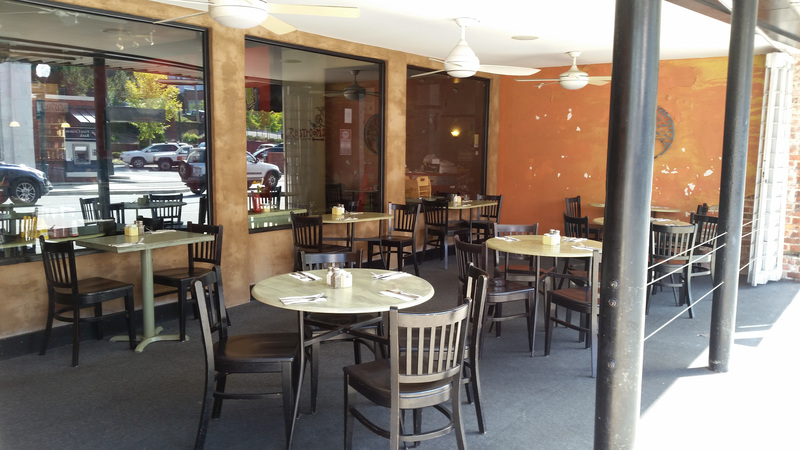 The property’s first use as a restaurant was in 1971, where it was an outdoor-style deli restaurant. 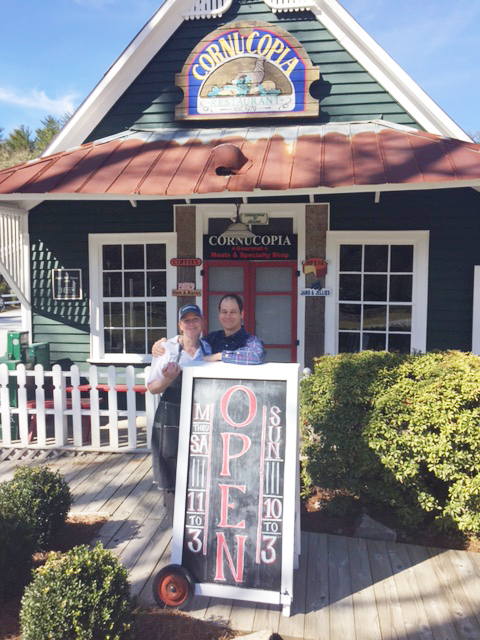 Cornucopia has kept with the outdoor theme and is now a casual spot to stop for lunch, or visitors can stop by for the more formal Sunday brunch or dinner. Cornucopia, like the name suggests, features a variety of dishes, tempting to any palate. Locals can’t get enough of the Arabian club, the black bean burger, or the chicken mandarin salad for lunch. At dinner, try an entrée with some local flair, like smoked trout or Southern-fried Ashley Farms chicken. Grab a seat around the fire pits on Boots Steakhouse’s beautiful outdoor seating area and enjoy the mild mountain temperatures while slicing into what is known to be one of the “Best Hand Cut Steaks in the Smokies.” Boots Steakhouse takes pride in offering guests the most fresh, highest quality food available on the market to create delectable meals from scratch. Known for their steaks and other grilled entrees, Boots provides a step back in time to the Wild West with the laid-back, 19th Century atmosphere. Sip on one of their hand-crafted cocktails under the patio’s twinkle lights and take a load off, while waiting for your meal to be prepared. 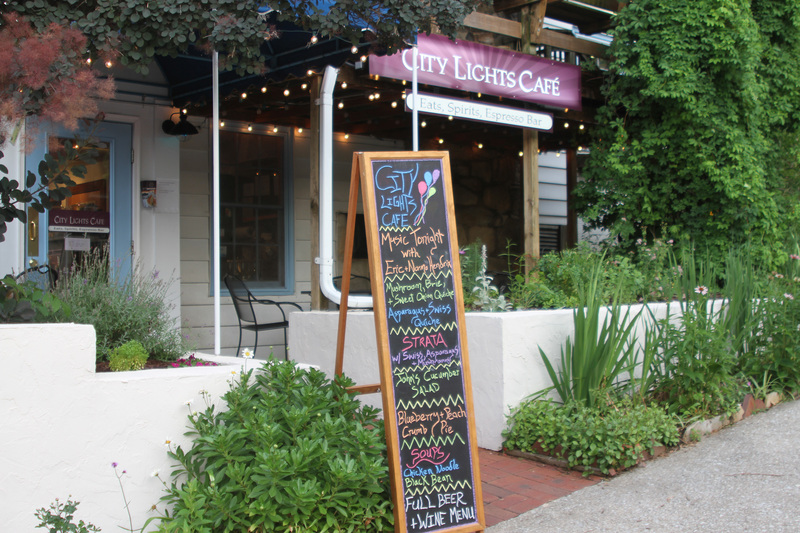 At Lulu’s on Main, grab a seat at one of their sidewalk tables and enjoy being front and center of downtown Sylva’s lively nightlife. Patio diners will enjoy a view of Jackson County’s statuesque courthouse that lights up the night to the right and the lights of the mountain towns in the distance to the left. Paired with a vibrant and eclectic ambiance, Chef Devin McCardle has created a menu which features a range of delectable vegetarian, vegan and gluten-free items to suit special diets. In addition, all menu items are certified hormone-free and humanely-raised, including fresh North Carolina seafood. The salmon, Szechuan salad and peanut butter pie are local favorites. Grab an after-dinner drink from the martini bar and enjoy people watching along Main Street. Later this year, Lulu’s will be moving to a larger location just down the street that will feature a large back patio overlooking Bridge Park. Stay tuned for updates! Bring your pooch along and post up on the 22-seat dog-friendly outdoor patio while enjoying the locally-sourced and organically produced dishes at this local gem. The café, whose name gives a nod to the adjacent landmark bookstore, has a rich history in town and plays host to several events inside and out such as an Open Mic night, live music, rotating art shows, literary events and even Yappy Hours with pets on the patio. Pick out a book from upstairs and settle in with one of the many caffeinated concoctions to enjoy this popular hangout that celebrities like Woody Harrelson, Frances McDormand and Peter Dinklage all discovered while in town for the filming of the Hollywood movie, Three Billboards Outside of Ebbing Missouri. The café provides many menu items that are and has a variety of gluten-free, vegan and vegetarian options. Be sure to try one of their infamous savory or sweet crepes, such as the Chicken Crepedilla, a menu favorite. For a truly unique al fresco experience, complete with an up-close-and-personal view of the Great Smoky Mountains Railroad, Foragers Canteen, offers outdoor seating right next to the train tracks in Dillsboro. The restaurant, which recently opened in May 2018, is located in the town’s old train depot and offers a menu featuring sustainably-raised, locally sourced, farm-to-table ingredients in a fast-casual dining experience for lunch and dinner. A couple of must tries from the menu are the “A Toast to Bacon,” which includes eight strips of bacon candied and peppered with house-made beer cheese and seasonal preserves and the “Plowman’s Platter,” which includes an assortment of house pickles, local cheeses and dry aged prosciutto. Grab a craft beer, wine or cocktail from the bar and take in the views of historic downtown Dillsboro and if you’re lucky, the train rushing by. At Foragers, you are definitely on the right side of the tracks! There is nothing better than sipping on one, or a few brews, munching on some fantastic food and listening to the sounds of water flowing below. Featuring both traditional brews and a number of seasonal and experimental beers, Innovation Brewing offers 32 hand-crafted ales on tap as well as a homemade ginger ale. Innovation has a large outdoor seating area featuring a covered patio and a beer garden style set up with long picnic tables to encourage patrons to mix and mingle. The outdoor seating area is kid and pet-friendly, and offers a view of Scott’s Creek, which runs adjacent to the brewery. In addition to the wildly popular craft beer at Innovation, Cosmic Carry Out, an on-site permanent food truck, serves up delicious food options such as burgers, fries, hotdogs and various vegetarian options. 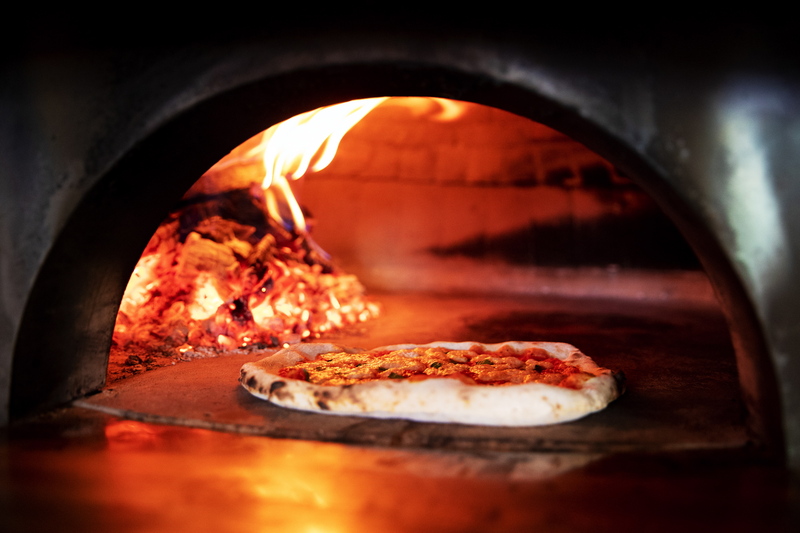 Innovation’s newest addition, Pie Times Pizza Company, is located right next door and serves fresh hand-made pizzas with local and unique ingredients such as Brussel sprouts and baby squash. Grab a pie and head to the patio to enjoy along with your surroundings.